Laboratory accidents can result in loss of time, damage to clothing and other property, and personal injury. By following suitable precautions, you can anticipate and prevent situations that could lead to accidents. You must make yourself completely familiar with the following safety rules. You will be required to sign a Laboratory Safety Contract stating that you have read these rules, agree to abide by them, and have watched the ACS Safety Video. At the beginning of the second laboratory period you may (instructor’s option) take a short multiple-choice and/or true false quiz on the rules; if you miss more than one question, you must pass a retest before you will be permitted in the laboratory. In your lab notebook copy at least 20 safety rules from the three sources and the ACS video. Do not work in the lab unless the lab assistant/supervisor or instructor is present. No unauthorized experimentation is allowed. Work carefully with full awareness of what you are doing, so as to avoid dropping or breaking equipment or spilling chemicals. Keep reagents and equipment well back from the edge of the lab bench. Never run in the lab. You may provide your own pair of safety glasses/goggles and wear them in the lab at all times or you may wear the eye protection glasses available in the cabinet in the lab room D-204. Safety glasses MUST meet or exceed ANSI Z87.1 (this should be indicated on the packaging). A lab apron or lab coat should also be worn at all times while working in the lab. You must wear shoes without open spaces; sandals and open-toe shoes are not acceptable. Confine long hair and neckties; they may catch fire, get into chemicals, or get caught in apparatus. Loose jewelry or rings can also be a hazard. Frilly or flared clothing, especially synthetics, are not safe around flames unless covered with a lab apron or coat. Do not bring food or drink into the lab. No eating or smoking is permitted in the lab. Never taste a chemical. Smell a chemical by fanning the air over the container to waft the vapor to your nose; never smell directly. Do not touch chemicals with your hands unless specifically directed to do so; if contact occurs, immediately flush the area with cool water. Mercury vapor is invisible but toxic over time. A broken thermometer should be reported immediately to the instructor. Never look directly into an open vessel in which a reaction is occurring that could cause spattering. When heating materials in any container, be sure that the open end does not point in the direction of other persons or yourself. If any chemical gets into your eyes, flush with water for at least 15 minutes. In case of fire, turn off the burner first. If there is a fire in a beaker, try to smother it with a watch glass or wet paper towel placed over the beaker. For an open flame, use the fire extinguisher pointed at the base of the flame. If the fire is uncontrollable, close all windows and evacuate the room and pull the fire alarm located near the emergency exit or in the hallway. After evacuating to a safe place, call 911, and campus security @ 766-6008 if you instructor is not present.. Skin burns should immediately be placed under cold running tap water for 5-10 minutes in order to remove the heat. If clothing catches on fire, use a fire blanket or safety shower. Do not force a glass tube or thermometer into a stopper; the glass can break and gash or stab you. 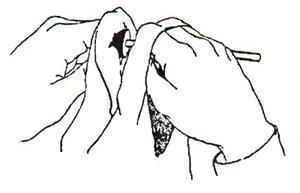 Instead, lubricate the end of the glass with glycerin; hold both the glass and the stopper with a cloth towel to protect your hands; grasp the glass close to the stopper; insert with a slow twisting motion (see figure below). Report all accidents and injuries to the instructor as soon as emergency action has been initiated. Never place chemicals directly on the balance pan. Instead, use a beaker, flask, watch glass, or piece of weighing paper. Read the label on a bottle twice before using the contents. Never contaminate the contents of a bottle by putting reagents back into it. Do NOT waste reagents; if you take too much, share it with others who still need your chemical. Label any sample or mixture that you prepare. Never mix any reagents unless specifically directed to do so. When mixing water and acid, always add acid to water otherwise violent spattering may occur. Remember the word “acid” alphabetically comes before “water,” so acid-into-water. Dispose of waste chemicals as directed. If a waste container becomes full, tell the instructor or lab assistant so they can get an empty replacement. Don’t just ignore the situation. Do not use cracked glassware, as it may break when stress is put on it. Place broken glassware in specifically designated containers in order to prevent injury to the cleaning personnel. If you discover that bottles of chemicals need to be refilled, tell the instructor or lab assistant. Keep the lab bench and tables clean. Wipe up all spills. Acid spills should be neutralized with sodium bicarbonate (which can be obtained from your instructor or lab assistant). 1. Wearing approved safety goggles is required at all times while in the lab. 2. Be aware of what is going on around you. 3. Unauthorized experiments are prohibited. 5. Food and beverages are prohibited in the lab. 6. Clothing which protects is necessary. 7. Locate the fire extinguisher, eye wash, safety shower, and first aid kit. 8. Know how to operate all safety equipment. 9. Never pipet by mouth, taste chemicals, or directly smell chemicals. 10. Avoid chemical contact with skin, eyes, and clothing. 11. Read chemical labels thoroughly and observe all precautions. 12. Never return chemicals to a reagent bottle unless told to do so. 13. Never pipet directly from a reagent bottle. 14. Do not carry reagent bottles to your desk. 15. Do not weigh chemicals directly on to the balance. 16. Dispose of chemicals in proper containers, according to directions from the instructor. 17. Never point a test tube containing a reacting mixture towards yourself or another person. 18. When inserting or removing glass tubing, protect your hands with a towel and gently twist, never force. Use glycerin for lubrication if necessary. 19. Keep a neat, uncluttered laboratory bench. 20. Place broken glassware in the designated container. 21. Report all accidents such as burns, cuts, chemical spills, etc. 22. A burn should be treated immediately by washing it with cold water. 23. Do not remove chemicals or equipment from the lab. 24. Make sure gas and water are turned off before leaving the lab. 25. Always wash your hands before leaving the lab.